Industrial Process News is always on the lookout for exceptional products and services, and Dawson Shanahan do both. So, we have no hesitation featuring them as our Engineering Company of the Month. Dawson Shanahan can trace their heritage back to 1920, when Edward Dawson opened an engine rebuilding business on one side of town, and Fred Shanahan started an engine rebuilding business on the other. A decision was made in 1943 to combine their skills and expertise, and so Dawson Shanahan was formed. Based in Welshpool, Wales, Dawson Shanahan has innovated with precision engineering and cold forming techniques to become the world’s leader in their field, and they’ve worked with very high-profile clients in sectors such as automotive, aerospace, power generation and electronics to name a few. We had the incredible opportunity to interview Les Reeves, Joint Managing Director, and Jeff Kiernan, Commercial Director to talk about the company, what they offer, and what has led them to become a world leader. Les Reeves says: “we provide specialised, custom engineered solutions to customers around the world. Our core services include cold forming, copper machining and CNC machining. In addition to this we have a dedicated assembly department, enabling us to assemble and test sub-assemblies and assemblies, ready for delivery direct to the production line. “Full service means just that: we’re here to support a business from the day we start working together. 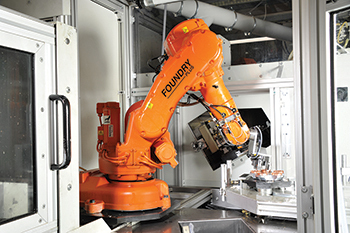 From design and testing, to prototyping and full volume production, we’re here to help develop engineered solutions meeting exact technical and commercial requirements – solutions that add real value to a company’s products or systems, in terms of reliability, performance, functionality and profitability. Dawson Shanahan prides itself on offering the very best quality but their lean process also ensures quality doesn’t cost a fortune. They know how to design, develop and produce customer specified parts, and re-engineer existing parts, so that unit cost can be reduced, while maintaining quality, performance and functionality. They use their extensive knowledge, experience and resources to look at the challenges of engineering precision components in new and innovative ways – often finding unique solutions that have passed competitors by. And their lead times continually impress customers. Dawson Shanahan always meets delivery promises. But delivering on time – every time – is just part of the story. They’re here to help a business meet the engineering challenges of this new and exciting world, and Dawson Shanahan understand the latest technologies, know which techniques work best in each application and deliver the custom engineered solutions that keep a business ahead of the competition. To find out more about Dawson Shanahan and to see the extensive range of products and services they offer visit the website below or alternatively contact the friendly, professional team using the following details. This entry was posted in Company of the Month and tagged Engineering. Bookmark the permalink.